March 28 is the anniversary of a wild and crazy day in the history of Ocean Beach. 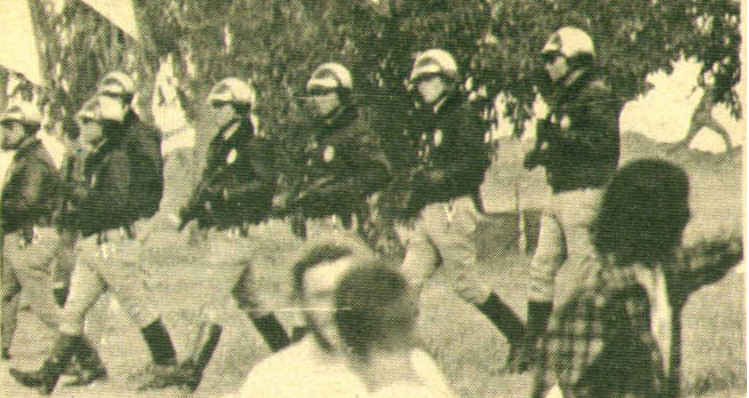 It was the day in 1971 when a peaceful gathering in what’s now Collier Park of hundreds of Ocean Beach anti-Vietnam war activists, environmentalists and college students were charged by a platoon of baton-wielding San Diego police officers – resulting in what became known as the Collier Park Riot. This most violent day in OB history came to become a significant watershed event in that same history and pushed Ocean Beach to become the community it is today. Wait – you might say. 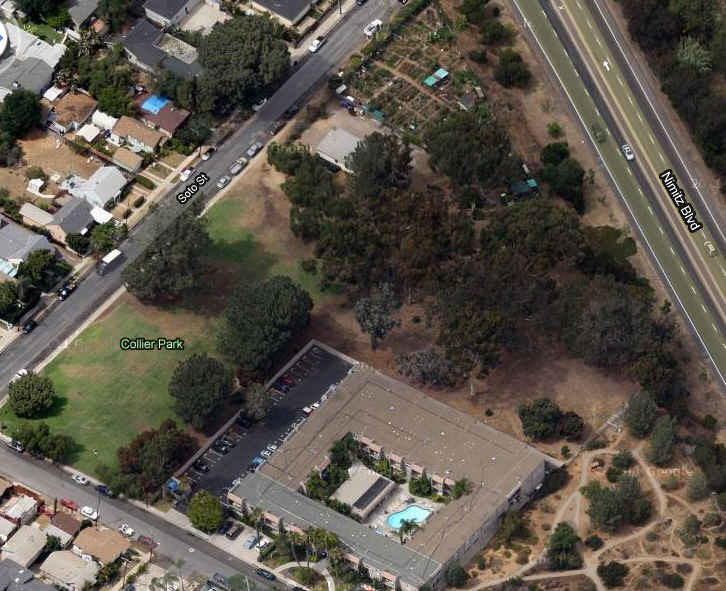 What is the Collier Park? And who is Collier? Keep reading. Late March in Ocean Beach nearly 5 decades ago had a different feel that it does today. It was definitely a different time. Back then young people in OB, hippies, counter-culture rebels, ghettoized college students – were under siege from San Diego’s establishment: landlords, mainstream media, city code enforcement officials, local merchants, the police. The persecution of the hippies was definitely a factor of life. It was a different time. The Vietnam war was raging – and so was the anti-Vietnam war movement. It hadn’t even been a year – when the Collier Park riot broke out – since National Guardsmen killed 4 students at Kent State University, wounding a dozen more during protests against the war. Two African-American students were gunned down by police at Jackson State; ten students were bayoneted by National Guardsmen at the University of New Mexico, students in New York were wounded with bird-shot from police rifles. The only people bringing guns on campuses in those days were the Guardsmen and cops. George Winne up at UC San Diego dosed himself with gasoline and lit himself on fire in protest of the war. Hundreds of college and high school campuses had been rocked by the largest protests against the war where millions of students were involved – yet the war continued. And rebellion was in the air. Young people in Ocean Beach were feeling feisty. Just that summer – the summer of 1970 – residents of OB had saved the beach at north OB (now Dog Beach) from becoming a jetty with yachts, the famous Battle Against the Jetty. And beginning in the Fall of 1970 local ecologists had begun the campaign to save what was left of DC Collier’s landgrant to northeast Ocean Beach. They ended up connecting with folks spearheading a campaign against the Vietnam war called the People’s Peace Treaty, many members of whom lived in OB. Together they concocted a two-segment demonstration for March 28, 1971: a giant anti-war demonstration and a protest project to save Collier Park by cleaning it up. Meanwhile, the San Diego Police Department was being run by a particularly aggressive police chief by the name of Ray Hoobler; Hoobler was known to pressure the officers of his mostly all-white, all-male force to carry out a policy of harsh treatments against Blacks, Mexican-Americans, gay San Diegans and young hippies. Thus the stage was set for the violent confrontation known as the Collier Park Riot. Here is a compilation of earlier writings about the anniversary. To counter the sands of time burying all memory of what happened at the end of March nearly 5 decades ago, the OB Rag has steadfastly attempted to rekindle the knowledge, if not the recollection, of the confluence of forces that erupted into the largest and most widespread riot in the history of Ocean Beach, a riot that made OB what it is today. Actually the protest began as a joint action that was initially against the Vietnam War, and then by design, morphed into a gathering at the future park site, which involved hundreds if not a few thousand OBcians and local students. Many, many people were at the war protest down at the beach. They then very peacefully walked up the sidewalks along Voltaire Street to the empty lots sitting atop the hill at Greene Street and Soto. At the site itself, activists had organized a free food line, a band was setting up, and the idea was to have people start to clean up the large lot, strew with old asphalt, glass, and the junk of decades of abandonment. F ifty people were arrested – some right out of their front yards, and some for simply being in the vicinity of the action. At least one patrol car was burned, one cop lost an eye, and many more citizens were injured by the police. (I was also arrested months later, went to trial, and did a few months in custody for assault.) When the dust finally settled after the fracas – Ocean Beach had changed forever. Thanks for the history. I was commemorating March 28 as the day I met my husband on the OB Pier 32 years ago (he died three years ago…) I’m glad to know the date’s auspicious story. I was checking in to see if the OB Pier has been repaired, but I guess it’s still unwalkable. I always wonder how in the aftermath the National Guardsman felt. I imagine they were probably kids just like the people they shot/stabbed. It should be called the Collier Park Police Riot. It was really, really scary to be a 16 year old surfer kid in the middle of that and have a vicious, extremely violent armed group chasing you swinging clubs in every direction. I had a skateboard in my hands which is the only reason I didn’t have my head bashed in. Turns out that holding my solid oak 36″ Champion Sidewalk Surfboard (with clay wheels) in front of my face can actually stop a billy club so well that, as it bounces off the wood, it throws the wielder of said weapon off balance enough to give you a chance to duck under the arm and keep running towards Granny’s apartment. And you can go faster than running once you hit clear pavement with it, too. Bonus! And yes, there was a lot of objects going through the air that often found their intended targets. A lot didn’t, and people not just cops were getting hit with hard objects. But active outdoors beach people tend to have nice strong throwing arms, especially from paddling. And people were PISSED, I mean really angry. Fed up. Tired of it. Not going to take it. Think Tienanmen Square in China. Stood up to Authority. The level of sound was so loud that picking out individual voices was nearly impossible until you got out to the edge of the scattering crowd. People were getting stepped on that fell or were knocked down, people screaming and yelling and…I remember it being incredibly confusing. The one thing I cannot forget is how much fun the cops were having chasing down and tackling and hitting people. It was extremely apparent from many of their faces. You see the feral human animal in the eyes when they are coming at you. As I said, scary to be where a police state goes into action. There never was a Mayberry PD, that was just a tv show I saw as a kid. With cell phone cameras & video it has gotten much harder for police officials to hide what they do, though, hasn’t it? Imagine the footage that would have come from that day? Pulitzer Prize material, a police riot from start to finish. Back then all the officials had to do was just call you a liar (or a hippy or a bum or a pot smoker) and that was that. You were always the liar. Now there’s video of police reality that pops up all over the country all the time that are like flashbacks in our memories of what we experienced. You know you are getting old when that happens. And there’s the change that hasn’t happened. 48 years and we is this society at? We can watch videos on utube of the same police violence but current not just in old films. That isn’t good. 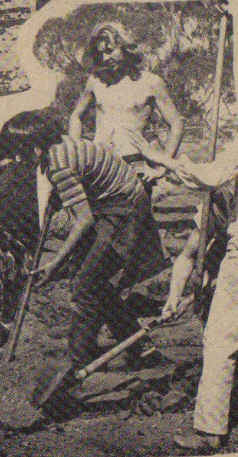 Off topic but a Question: Is that picture under the caption of ‘The Dust Settles,’ the kid with the Beatle haircut and shovel, me? Holy crap! Never seen it before but it sure could be… My hair was growing back out from being cut the summer before in exchange for a new surfboard (the only way my father could get me to cut it) and…that’s what I looked like then from the old pictures in the picture boxes. Can’t see the face. Just may be. We sure were young back then.